Vogue Italia's editor Franca Sozzani is rebelling making a break away from her other Vogue counterparts yet again by putting another afro-latin model, in this case Joan Smalls, on its March 2012 cover. Proving again why I heart Franca and Vogue Italia. We recall Joan from her photo shoot with Steven Meisel for Tom Ford. I swooned over this shoot.. Of course every time I see Tom Ford or his creations I get girlie wood..
#OverTheTop is another shoot by famous fashion photographer Steven Meisel and will be on the newsstand this week. Vogue.it has a full story on the shoot and a GIF slideshow. This issue will more than likely boost sales for the magazine like their Black issue in 2008 did. In fact, that issue was so popular they had to re-print it twice. 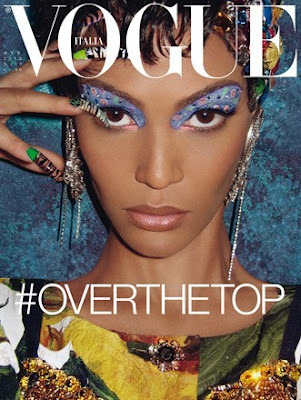 4 comments on "In The Know--Joan Smalls on the cover of Vogue Italia"
Smalls is so damn gorgeous! What's your take on all the controversy around this shoot (eg. Jezebel.com, etc.) - for ridiculing poor black and latino culture?